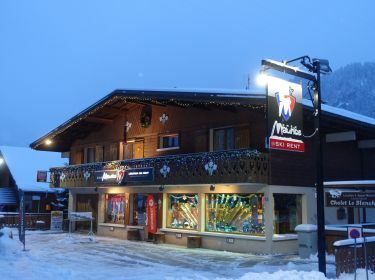 Your ski rental Châtel with the store Chez Maurice. Book online and save on your rental ski and mountain equipment in Chatel. Hire specialist skiing an snowboarding in Châtel, we guarantee you the latest equipment, in the best condition, all of which can be fitted to meet your requirements. The professionalism and advice, at Chez Maurice since 1971 has given us a strong reputation for customer service, quality, and knowledge both of equipment and the ski area. Located on the Linga road, close to the center village, easy access, free parking is available for our customers. Rent your ski and snowboard equipment on line and enjoy the best rates with 7th day free! See you soon in our station. Chez Maurice Ski shop Team. Hire, maintenance, and repair of all your ski equipment. Free parking is available for you pick up and return your skis. Book online and get up to 35% discount on your ski rental. Special rates for groups, schools and compagnies. If you want to swap skis for a snowboard (same category): there is no additional cost. Free car park is available when you just rent your skis or snowboard. Our worshop is equiped with the latest machines to repair your equipment and provide a quality service: stone grindind / ceramic disc.